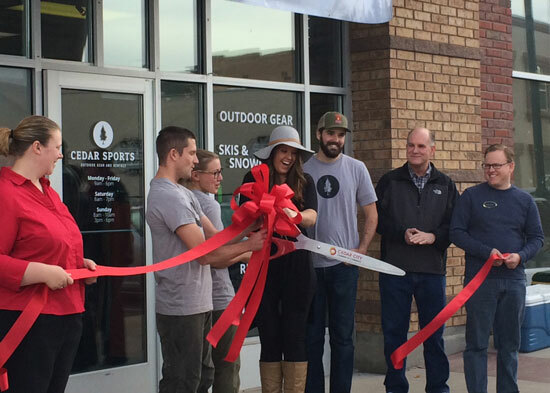 A team of four Southern Utah University alumni just opened Cedar Sports, Cedar City’s newest outdoor gear and rental shop. The store opened on November 1 and co-owners David Whitmore, Leisel Whitmore, Jaxon Haderlie, and Sarah Haderlie credit their entrepreneurial spirit to SUU. It is because of their classroom and hands-on experiences in both outdoor skills classes and business courses that this group of alum feel confident opening an outdoor gear store in Cedar City. The Whitmores and Haderlies hope to provide opportunities for the southern Utah community to easily get outside, find new hobbies, and purchase quality equipment at an affordable price. The owners are deeply invested in this community and are working to establish a partnership with SUU Outdoors, a gear rental shop on campus. The Whitmores and Sarah Haderlie all graduated with degrees in outdoor recreation and tourism management and have spent the last three years working in a variety of outdoor jobs. Shortly following the completion of his accounting degree, Jaxon Haderlie began pursuing a master’s degree in accounting and business administration, which will be completed next December. Cedar Sports is already breathing life into Cedar City, affectionately known as the gateway to the National Parks. With so many recreational options in southern Utah, Cedar Sports offers new and used equipment for a variety of outdoor experiences including snow sports, hiking, camping and water activities. The developing company is partnering with industry leaders who specialize in purchasing new and used equipment from many major brands. In turn, the owners of Cedar Sports are passing the quality and savings on to the community in hopes of growing support and engagement in the outdoors. With energy, passion and an outdoor education from Southern Utah University, Cedar Sports intends to become a fixed asset in southern Utah’s long history of outdoor enthusiasts.